← Daniel Bard: Not Ready For Prime Time Player. Not good to Kiss your Sister, especially if she’s Brittish, but we celebrate the draw nonetheless. 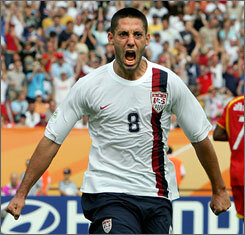 Dempsey, who scored against England, is at the end of almost every single hard foul. Apparently... he's not roundly loved outside of the US. The American Footballers kicked off the 2010 World Cup by nicking a point of a draw with the unlikable Brits. By earning a point, we are well positioned to be well positioned. After the Slovs took out Algeria on a 1, nill winner, they sit atop the Group C with 3 points. The Americans must not lose the remainder of the group stage and another draw would mean our fate would rest on the feet of another country’s performance. After an early goal off the foot of Steven Gerrard, England’s premier Attacking Midfielder, Clint Dempsey’s range tester in the 39th minute squeaked by England’s unsure goaltender to find the back of the goal webbing in what would be our only goal, leading to the 1, 1 split. Tim Howard, the American Keeper, took Man of the Match honors after preventing 17 of England's 18 shots from counting. The Stars and Stripes play next on Friday. Cheer hard. since you’ve demonstrated moderate understanding of soccer i can only conclude that you are unamurrikan and potentially a communist spy….